Translation:His last name is Wang. Tā is written different based on the radicals, but pronounced the same way, 他 breaks down into 2 parts, 人 which is "man" (the left part of the character) and 也 which means "also" or "other" - so literally speaking this character means "other male person". Female on the other hand is still Tā but is written as 她 where the first radical comes from 女 meaning "female". Thank you E1M9. That was well explained. Yes. I almost put that, but then it occurred to me that it is very useful to remember this phrase specifically if you are telling someone about the fact that the last name is always placed in the first position in Chinese. I answered "last name" also to help me learn all the characters since I find learning this language to be quite a different challenge. So the middle character is xing and when pronounced on its own sounds like "shin"
but in the sentence the middle character sounds much different. What's going on there? Yes. It sounds like "s'i/shi" in this audio. And the first character sounds like "pa/pha" here, but not like "ta"
This feels like it was chosen to trip up students with a background in Chinese... Putting a sentence like that in a lesson about occupations would definitely get someone to mistranslate it as ‘he is a king’, haha. Why is shi not required here? ie xing shi? Xing is already a verb, "to have ... as a surname". He has the surname Wang makes sense. His has the surname Wang doesn't make sense. That is correct, my friend. Though it would be otherwise, in the context of naming a surname, 姓 is a verb, not a noun. He told that it was a verb, actually, doesn't he? How did you deducted "his"in your second example (which doesn't make sense) I see symbol for "he" and the unknown one, does it turn 'he' to 'his? Surname and last name. I think is the same. If i want to say "is wang his last name" all I have to do is add ma. Right?? 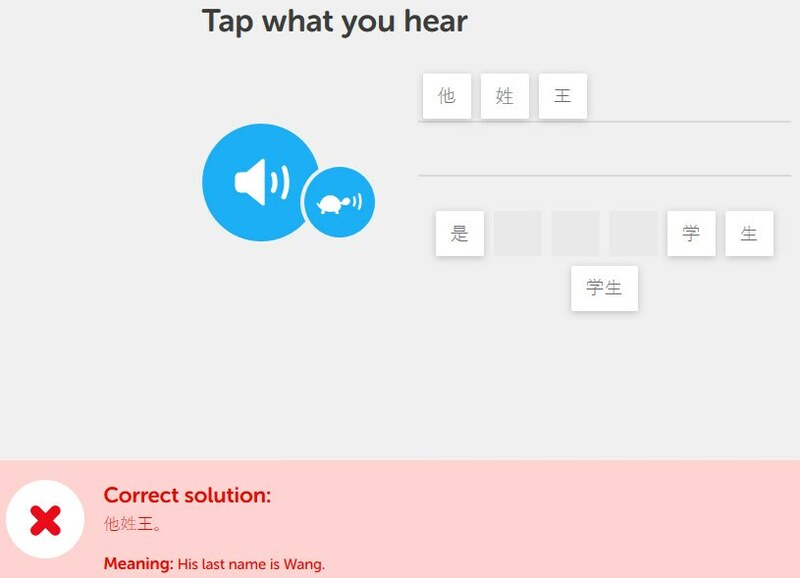 "He is Mr. Wang" isn't correct? It could also be "She is Mrs. Wang"
"他" means "he/him" and "她" means "she/her". You can use either "他們" or "她們" for they/them. Ta does not choose the gender. This marks she wrong. It randomly chooses the gender for ta. It does based on the key on the character though? If it's the "T" shaped-key at the start of "ta" it's male, if it's the vaguely "4" shaped-key it's female. There's no oral indication as far as I know, however.